Dress like Jamie Fraser from the popular Starz series, Outlander! This Outlander Jaime Fraser's Leather Coat is straight out of the TV series! 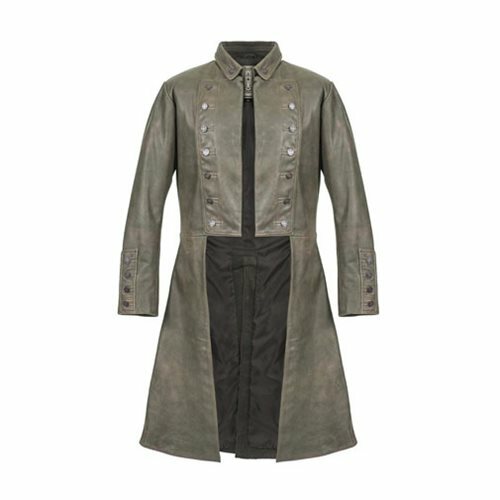 Stay warm while dressing in style with this expertly crafted coat which features a historically accurate 18th century design and has a full skirted genuine distressed leather coat. Fit for nobility, this coat comes with 40 antique brass buttons, is fully lined, and even comes with corded buttonholes and seams for extra durability. Any fan of the clan Patriarch would be excited to have this in their wardrobe. Add this truly unique piece to your collection.